A few weeks ago my dear friend SonicAdventure approached me for a really special collaboration project. 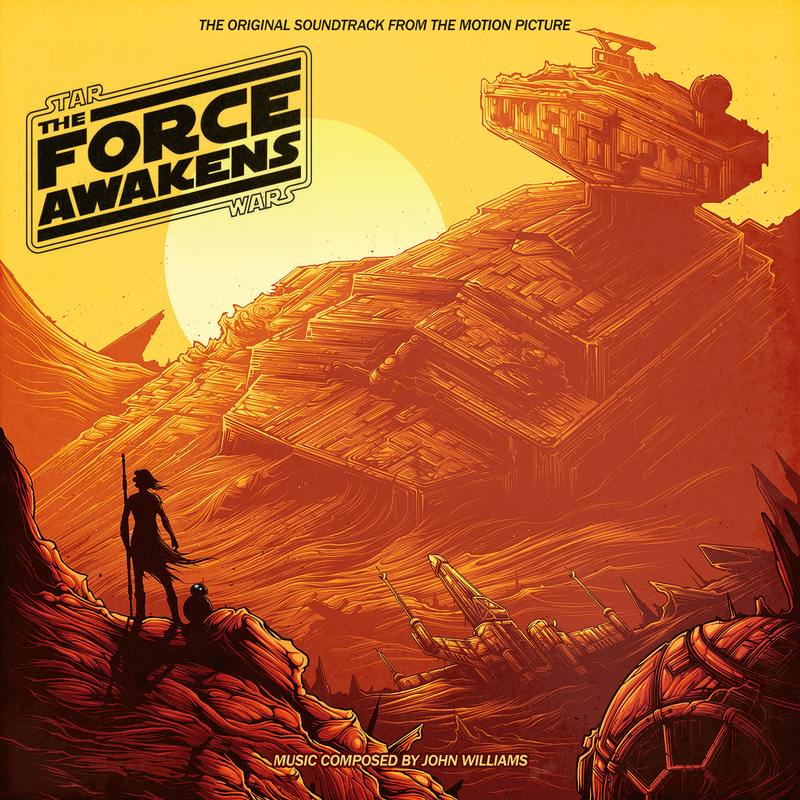 A Deluxe Edition of Star Wars: The Force Awakens, containing music from both the official soundtrack and the “For Your Consideration” promo album that was published by Disney during the awards season. Sonic did all the audio wizardry (editing, mixing, mastering), while I was free to do anything with my custom cover art. And it was an absolute blast (as John Williams would call it), by far the most joyful cover making experience I’ve had so far. Naturally for this fan-release I revisited my initial custom covers from not so long ago and designed full blown jewel case artworks for my personal front motives. I came up with seven unique cover sets (resulting in fifty-three individual images! ), with each one following an individual design scheme. And if you’re a true Star Wars fan you may possibly recognize some of those. With the first cover set I wanted to come up with something that could easily be lined up with the official soundtracks for the previous six soundtrack albums. I consider this to be my “official” artwork, with all subsequent designs below to be alternates. 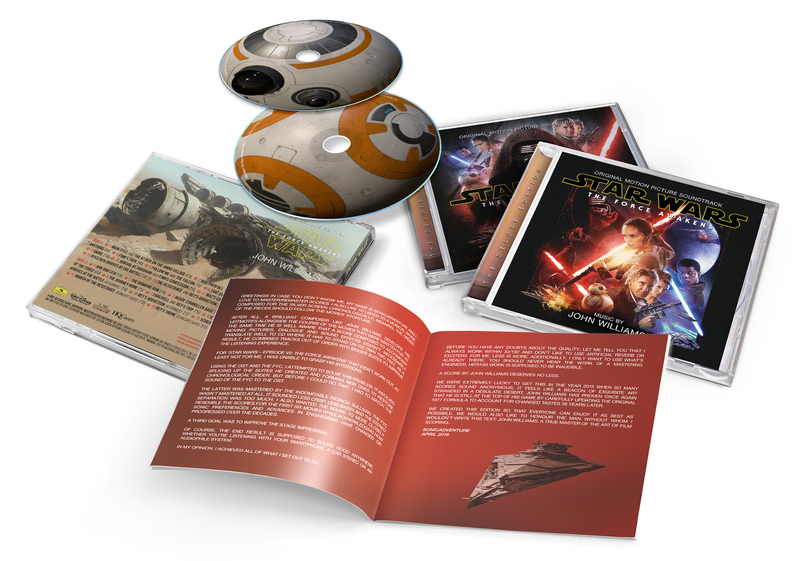 The BB-8 discs (which I’m absolutely in love with!) were accomplished by taking screenshots of this 3D render model. I was free to move and zoom the camera to the exact right spot to get my desired angles. My first version was properly labelled with logos and additional information, but with every revision more and more of that stuff fell under the table, until I finally removed all the clutter and only feature BB-8 himself. This orange/white droid is already an icon and it takes no further depiction to identify this as a Star Wars soundtrack. Just picturing that little fellow spinning around in your stereo makes me smiling inside. This one is fairly similar to the original design, but differs in certain aspects. The first thing to catch the eye of course is the prequels style logo design. I’ve never really liked this shiny metal treatment that much, but I guess that is also related to my disappointment with the prequel films. Another difference is the more elaborate typography, using “Albertus MT” instead of the plain “Helvetica Neue LT” from the original cover artwork. Admittedly, this set wouldn’t have seen the light of day without the motive of the first front cover (#9). Blake Armstrong‘s stunning and most faithful homage to Drew Struzan is possibly the most beautiful TFA fan-poster I have seen so far. And it worked absolutely perfect as an album art. A little trivia side note: The original poster featured a young A New Hope Han Solo and I meticulously repainted him with the aged one from the official The Force Awakens poster. 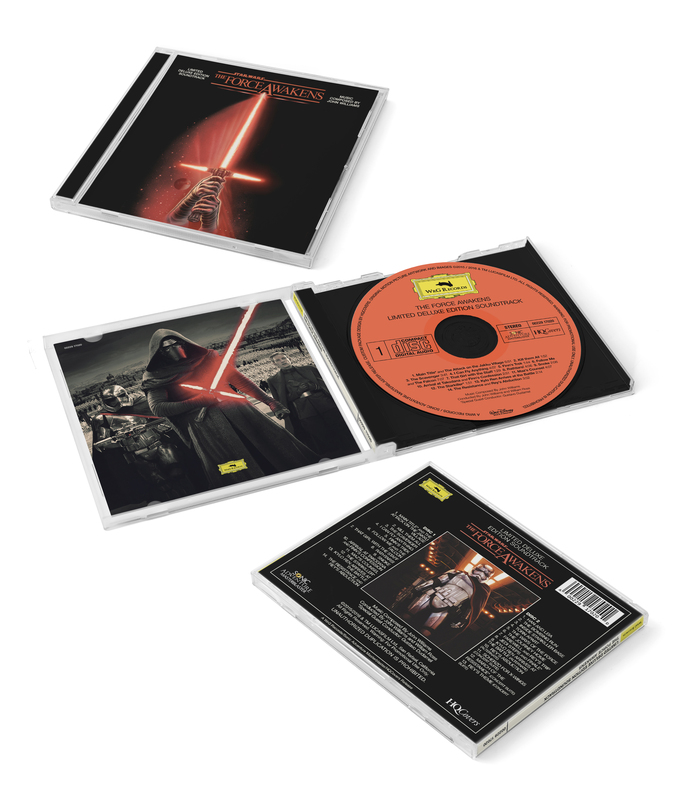 The back cover is a direct homage to the prequel soundtracks, especially The Phantom Menace. I tried to stay as accurate as possible, down to the smallest details. For the font type I had to test several different designs until I finally found a well-weighted and legible one (“TradeGothic LT“) that could display both tracklists within the canvas, without excessive kerning or tracking. The following custom cover set was the very first one I’ve made for this project and somehow it’s still the most beautiful to me. While the front artwork was taken directly from my initial (and highly popular) Deluxe Edition series, the back cover is a carbon-copy of the 1997 Special Edition digipacks from RCA Victor. Those legendary releases may not have had the best sound remastering ever, but their glorious package design was a real stunner. The laser-edged holographic discs were obviously the most challenging part of this set. But I had the advantage of already having practiced that technique on Minority Report, so I was a lot faster this time around. And for the old-fashioned bootleggers of you I’ve also included a plain black and white version, which should be a little easier to print. One of the more complicated versions within this series was the Empire influenced cover set below. Not for the technical challenge though, but for the decision where to properly put Dan Mumford‘s paintings. The front cover was a given, since it basically was the same cover (minus some slight refinements) as last December. But I kept juggling around the remaining three images for quite a long time until I finally settled on the arrangement below. 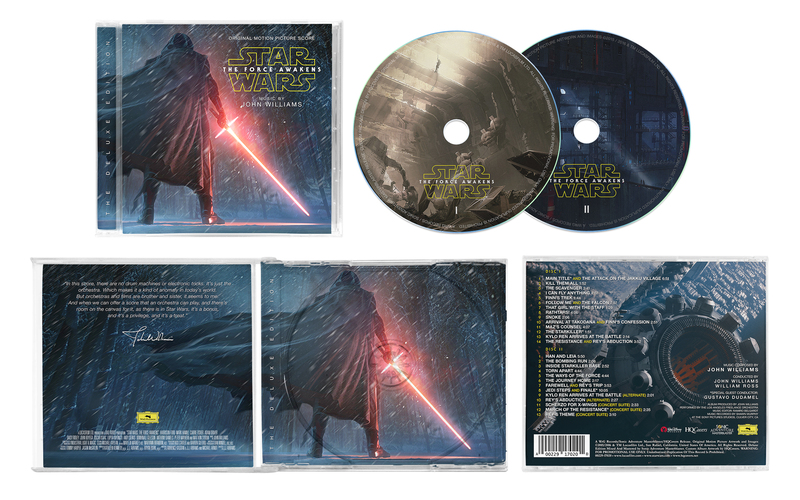 Originally this set was meant to also include Dan Mumford’s additional Art Awakens print, but the only place left was the CD tray inlay (#27). And I didn’t want to loose the Rey/BB-8 one, because that was far too much work to just scrap it. After all I manually widened the image to get a nice transition from the front cover to the inlay. And considering the crazy amount of detail Mr. Mumford puts into his works, it was a real challenge for me to repaint all those very thin lines and contours. Just compare those two images in your browser tabs and you’ll know what I mean. The only logical step after Empire of course was Return of the Jedi. With an already finished front cover, the rest of this set was fairly simple. Some colour corrections and font matchings and I was more or less done. Okay, the tray inlay needed some work, because my desired image of the Starkiller Base was cut off at the bottom. But thanks to Photoshop magical content aware fill tool, this problem was solved in almost no time. I admit the disc labels could have used a little more creativity, but the original label is exactly as stark and text heavy as mine. This was a typical thing of the early 80’s and I wanted this cover set to be as genuine as possible, so I just went with it. The Concept Artwork set, if one could call it like that, was first and foremost created because of that stylish CGI painting from ILM. Kylo Ren, as he is menacingly posing in this fantastic snowy forest set piece, is cool as hell! And the image works absolutely great as a soundtrack front cover. Just like on the Empire Strikes Back set before, I manually widened the front cover to make it span the whole booklet (#37). 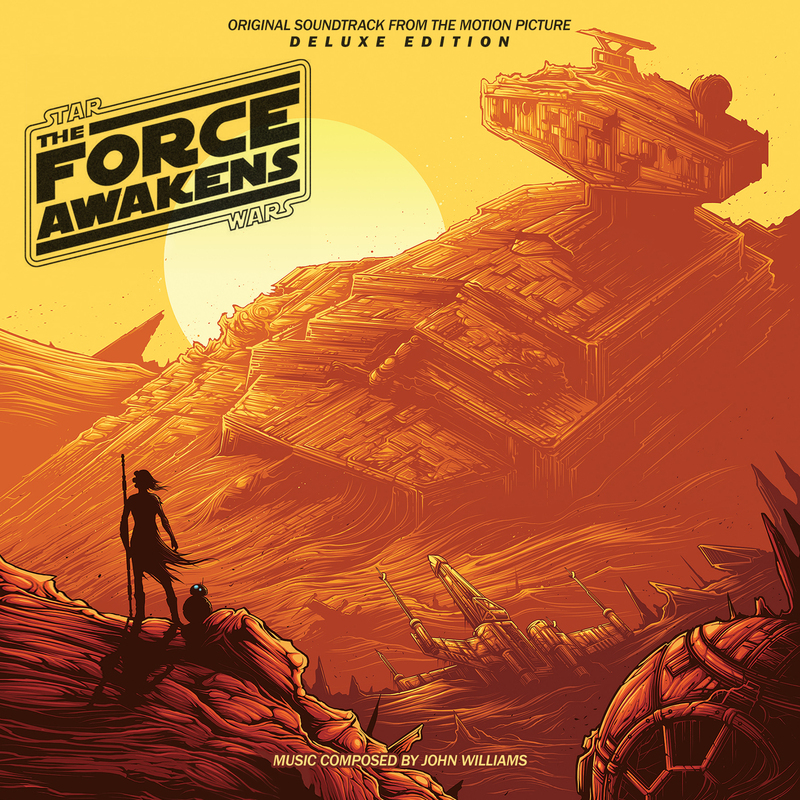 The quote from John Williams was a spontaneous idea that turned out really nice. 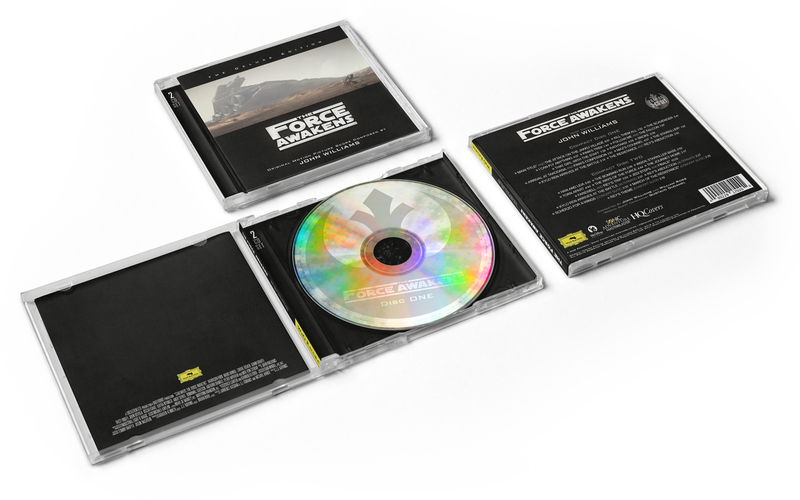 The back cover, which is based on another CGI concept artwork (presumably by ILM again) went through numerous iterations, from absolute minimalism (no text at all) to a design crammed to the last corner. I’ve settled for a healthy remedy. Perhaps the most beautiful and artistic design comes at last. I know of a lot of people who favoured my initial Drew Struzan based custom cover (#42) and to be honest, I always preferred that one as well. With cover #43 as its dark soul mate, this yin and yang pair of covers was calling out for the best treatment possible. And that was my defined goal. 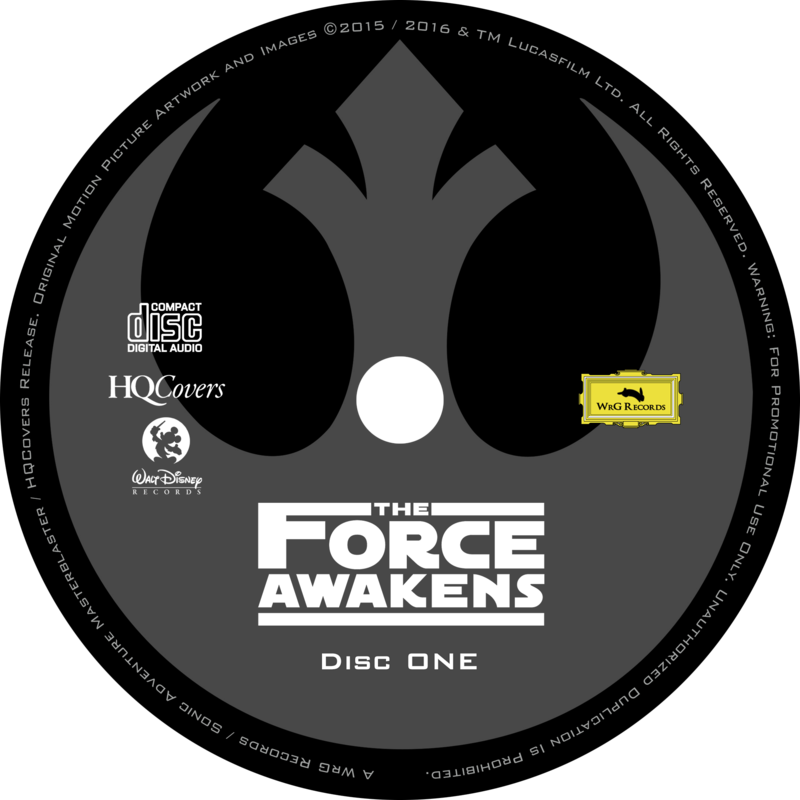 From the early stages on I planned this set as two different versions, following the colours of Mark Englert‘s “Resistance” (#50, #52) and “First Order” (#51, #53) badges that served as the disc labels on this collection. When I started working on the back cover inspiration came from a completely different front: Queen’s 1976 rock album A Night at the Opera served as a starting point from which on I proceeded section-by-section and slowly turned it into a genuine Star Wars artwork. It’s those special ingredients that make this set stand out from the crowd. The muted colours, washed out textures, hand-drawn aesthetics and vintage font choices, all those unique elements conglomerate into one custom covers set that is indeed worthy of its “Deluxe Edition” name. The Digital Booklet PDF below was the final icing on this overly delicious (and also, very healthy and nutritious) cake. 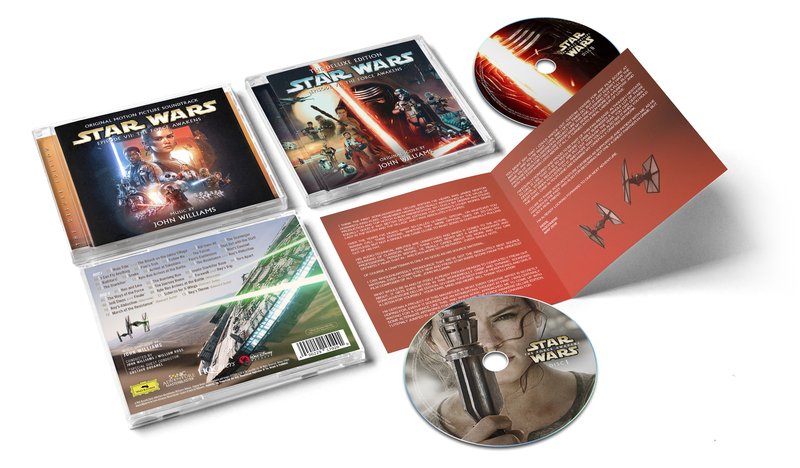 Originally made early January for my first The Force Awakens blog post, I never found use for the alternate front sleeve and the additional pages that I’ve made. But now it has found its proper place, well seated within this wonderful collection. where would one go about finding this Deluxe Edition? Where might this contact form be? Man, i don’t even know where to begin! So i’ll simply issue a HUGE thanks to the both of you. Your covers really make me wish i had a CD-printing studio in my basement – and the space to properly display them all. Outstanding work! :-O Is this a mockup or the real thing?